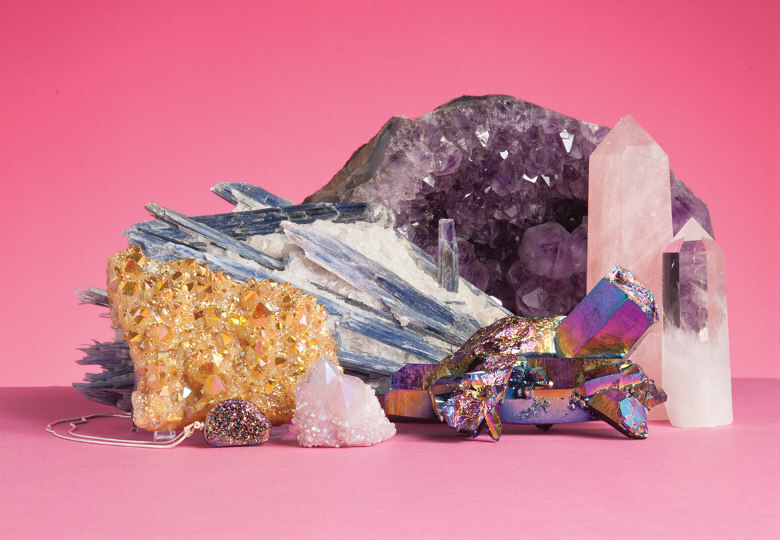 From home décor to jewelry, crystals are having a moment again. Need to mend a broken heart? rose quartz crystal can help with that. Or ward off bad energy? Try wearing a black tourmaline crystal. AJ Crecelius of NW Crystals (Ballard, 2221 NW 56th St.; 424.419.9789), a shop selling healing crystals since 2015, believes that the metaphysical properties of certain stones can help cure ailments like these. Crecelius comes from a family of both scientists (her father worked on the International Space Station) and religious people (ministers and shamans). “The scientific side of me knows all about how crystals are used to conduct electricity in electronic products, and the more spiritual side of me began to wonder why they couldn’t be used the same way for the human body,” she says. Science has yet to prove any metaphysical properties, and maintains that crystals are just colorful rocks that might have a placebo effect. Whatever you believe, crystals are one of the biggest beauty and wellness trends right now—part of a new New Age lifestyle that incorporates everything from meditation and yoga to forest bathing and astrology. If you’re ready to test the properties of crystals (and related accessories), these purveyors will help you find a match for what ails you. The Vajra (Capitol Hill, 518 Broadway Ave. E; 206.323.7846; thevajra.com): This little 750-square-foot hidden gem on Capitol Hill has been selling incense, oils and meditation supplies since 1989, and offers a fine crystal collection complete with a variety of polished stones and crystal jewelry; tarot card readings are another option. The Dank Crystal (dankcrystal.com): Longtime Sub Pop publicist Bekah Zietz is also an artisanal candle maker; her hand-poured soy wax candles—available online and in retail locations such as the Sub Pop store at Sea-Tac airport—come in a variety of aromas, and all of them encase a purified crystal. Try the “Golden Garden” scent with a hint of gardenias (and bonus vibrating crystal “energy”). Agate Designs (Pioneer Square, 120 First Ave. S; 206.621.3063; agatedesigns.com): This family-owned shop carries natural, unpolished crystals and minerals and fossils from all over the world, some of which are millions of years old. European Rejuvenation Center (Bellevue, 4315 Factoria Blvd. SE, Suite A; 425.746.6100; europeanrejuvenationcenter.com): Cleanse, balance and recharge while lying on one of this spa’s crystal healing beds. During this treatment, light is projected through polished quartz crystals, which focus colored light onto the seven respective chakra points (energy centers) of the body. After the session ($20 for 20 minutes), some clients report higher energy levels and less stress.